Tang Soo Do is a unique Martial Art, originating in Korea. Because of the neighboring influence of, not to mention the periodic historical occupation by both China and Japan on the Korean peninsula, Tang Soo Do can also be described as a Korean expression of an Okinawan art based soundly on Chinese principles of movement. It is a method of empty hand and foot fighting based on the scientific use of the body. 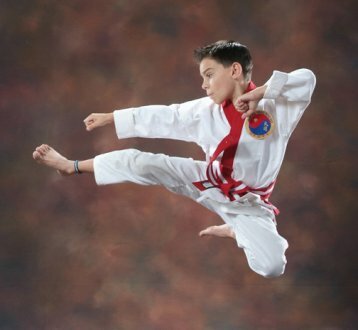 The development of superior kicking is a feature of Tang Soo Do, the advanced flying and jumping kicks are unsurpassed by any other Martial Arts system. Through intensive mental and physical training; Tang Soo Do nurtures harmony between mind and body. The ultimate goal of Tang Soo Do is character development and its practice improves self discipline, commitment, self confidence, self control, integrity and respect. Why learn Tang Soo Do? Tang Soo Do is essentially an Art of Self Defense. 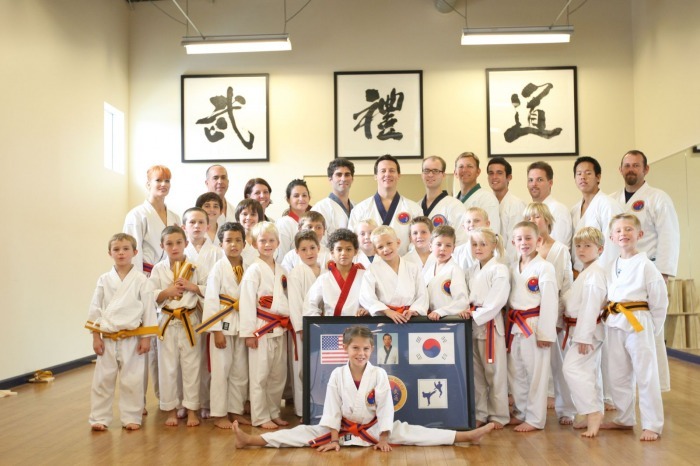 Moreover, Tang Soo Do helps to develop healthy, physically fit and well-adjusted individuals. It gives you security and peace of mind from knowing how to defend yourself. The training methods are designed to develop muscle tone, weight control, cardiovascular endurance, coordination and flexibility. Tang Soo Do is a life time activity for all ages, it’s a great stress reliever and it’s never out of season. You are never too short, too tall, too young or too old to benefit from martial arts training. If you are medically fit to participate in moderate physical activity you can learn Tang Soo Do. Anyone can learn Tang Soo Do. People of all ages are encouraged to become involved with this unique Martial Art. Children may start as early as the age of four. Our programs are nationally recognized and we have a special designed training curriculum for children. We don’t simply teach “Kick and Punch”, we teach Confidence! Tang Soo Do training produces a life-long commitment to health and personal integrity. It teaches respect for self and others. Parents constantly remark about the tremendous improvement in attitude and in school performance since enrolling their children in our program. 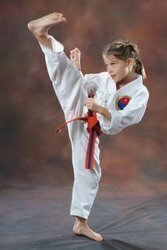 Tang Soo Do provides the tools children need to strengthen both their minds and bodies. Our students develop the ‘Yes I Can’ attitude. How is martial arts training good for my health? Tang Soo Do is a cardiovascular exercise, therefore it will improve your overall strength, speed and endurance. Stretching is a regular part of a martial arts training regimen and as a result of keeping the body pliant and flexible you will maintain your youthful vigor into old age. Other benefits reported by Tang Soo Do students are loss of weight, lower blood pressure and improved mental outlook resulting in increased self-esteem. Tang Soo Do involves a whole body workout which means your body's conditioning develops in a well-balanced manner. I'm out of shape, will I be able to do martial arts? Yes, absolutely! All new students are mainstreamed into beginner classes. These classes are geared towards students who have not been active for years, as well as, towards students who may be athletic but who have not had any martial arts experience. The martial arts a functional and intense practice can develop an awesome physique, but everyone starts somewhere. All students are reminded to go at their own pace in the early stages of training. In our classes our students not only learn self-defense, mental awareness and self-control but they also attain high levels of physical fitness as they gradually improve and progress at a rate that is most comfortable for them. The bottom line is we are all ultimately responsible for pushing ourselves and that the great thing about martial arts training. Martial arts training is an activity that allows you to become as fit or developed as you can make yourself. Tang Soo Do is a classical martial art and therefore self-defense training is a mainstay to our program. Students are taught to defend themselves quickly, efficiently and in a realistic manner. We of course, emphasize the importance of developing the awareness, assertiveness and confidence to avoid most confrontations. When it comes to knowledge of self-defense, it is better to have it and not need it than it is to need it and not have it. Will learning martial arts turn my child into a bully? Some parents worry that martial arts will make their children aggressive. Although training in the purest form of combat develops a warrior mindset; it does not cultivate a “Bully mentality”. Unfortunately, bullies are born or forged through social evolution. Bullies will gravitate towards anything that can make them a more fearsome individual. Perhaps bullies may be attracted to martial arts training. The mere training in the martial arts does not cultivate the bully mentality however. The person either is or isn't a bully. A good instructor will spot this trait and prevent that person from training or try to change that pattern through a combination of positive and negative reinforcement. What do the colorful belts mean? Starting with white belt a student matures through a change of seasons with green (spring), red (summer) and midnight blue (fall) belts. The midnight blue belt is unique to Tang Soo Do/Soo Bahk Do and is equivalent to a black belt used by other styles. Gold and orange belts are intermediate steps to green belt serving as additional incentive in the first year or two of training. What is "traditional" martial arts training? There are as many different martial arts schools and approaches as can possibly be imagined. Some schools are "sports" oriented, yet others are centered on combat skills. Traditional Tang Soo Do practice, however, sees martial arts training as a cultural experience that is multi-dimensional. Principles and concepts in addition to physical techniques are all intended to uplift the participant. The objective is not just to practice a martial art but to become a martial artist. In this way, the training has applications that extend beyond the dojang and into your everyday living. While there are sporting aspects and activities in our art, Tang Soo Do is first and foremost an art form, not a merely a sport: It is a living art! May I visit a class to watch? Yes! The instructor and students at OCKicks always welcome visitors to come in and observe a training session. Often people have a misconception regarding training in the martial arts, so observing a training session is the best way for you to see exactly what we do in Tang Soo Do and if it is for you! It is always recommended that you contact the dojang first so your visit does not come unexpected, but walk-ins are always greeted warmly. If you have any questions regarding your observations, the instructor will be happy to answer them for you at the end of class. Any time! We have an Introductory Program for all interested individuals. You can also try out classes privately with an Instructor before moving to our group lessons. If you would like to view a class or schedule an appointment for our Introductory Program, call us (949) 874-KICK (5425). We offer single memberships and family discounts. Regular tuition rates start at approximately $120-150 per month for full time membership, but no one is turned away for inability to pay full tuition. We'll help you choose the payment plan that best suits your family's budget. Ask us about our part-time tuition to help your family get involved in the benefits we offer for personal development. Our Introductory Course is one month of lessons and a student’s uniform for $99.00 and trial classes are always free. Use our quick registration form to sign-up today! Will I still have time to play organized sports? We understand the desire to be involved in organized sports such as soccer, baseball, basketball and football and the time constraints it puts on the family schedule. We are very flexible when it comes to seasonal sports. We allow students to "suspend" their membership, for seasonal sports that require daily or near daily practice, resuming payments and lessons at the end of the season. We strongly recommend that students continue their training once a week during that time if at all possible (at no charge) as it tends to enhance their experience with other activities. What happens if my child wants to quit / take a break? Let us assure you, your child will want to quit. However every child who has worked through this, earned their black belt and changed their lives forever had one thing in common: A parent who felt this program had some valuable lessons to teach them. So the question isn't whether they are bored or want to quit... the real question is whether you feel this program has value that you feel your child could benefit from. The same thing can be said for adults. We all go through periods where we think "I'll just go to the next class" and then missing one turns into missing many. We remind our students that "when you rest, you rust." Working through those difficult times is when we learn the most about ourselves, our perseverance and mental discipline, building our self-confidence along the way.